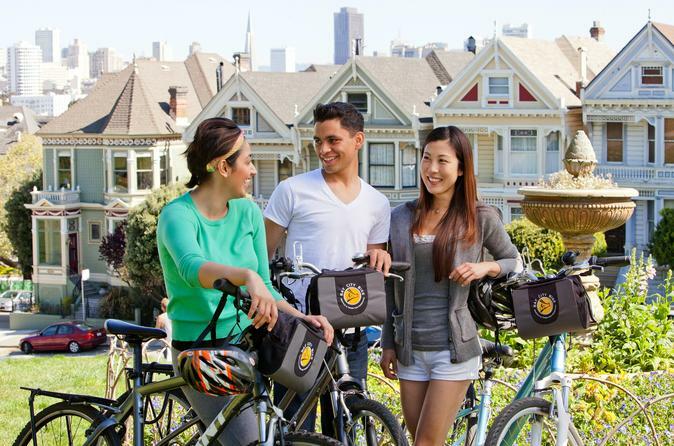 See the best of San Francisco on this comprehensive (but easy) bike tour! Admire top San Francisco attractions including the Transamerica Pyramid, AT&T Park and Fisherman's Wharf. Ride through major neighborhoods such as North Beach, the Mission, the Castro and Haight-Ashbury as you learn about the history and landmarks of San Francisco from your knowledgeable guide. Your grand bike tour of San Francisco begins at Fisherman's Wharf, where you'll be outfitted with a bike as well as all safety equipment. Your guide takes you on an easy ride over flat surfaces in this city known for its hills, and your route is customized with off-the-beaten track nooks that only a local would know. Be prepared for weather changes as you follow your guide all over San Francisco. You'll stop up to 10 times during the tour for photo ops, and to hear facts and anecdotes about the city's history and sights. In addition, you can take a break to purchase lunch and a beverage from a gathering of local food trucks, and later enjoy coffee and refreshments at a cool coffee bar (food and drinks are your own expense). Cruise through the back alleys of North Beach, the city's 'Little Italy,' and capture close-up photos of the Transamerica Pyramid. See the historic supper clubs in the once illicit Barbary Coast neighborhood, and ride around AT&T Park, home to the San Francisco Giants baseball team. Delight in the charming Victorian and Edwardian houses set against the backdrop of the San Francisco skyline and known as the 'Painted Ladies' of Alamo Square. Make your way through eclectic San Francisco neighborhoods including the Mexican-influenced Mission, the flamboyant Castro and the bohemian Haight-Ashbury, where hippies once flocked. Travel through NOPA (North of the Panhandle) and see the Civic Center. Ride through Polk Gulch, San Francisco's original gay neighborhood. Observe street art and the locals that give each of these areas their unique character. Your 4-hour bike ride around San Francisco concludes at Aquatic Park at lively Fisherman's Wharf, but you can keep using your bike for the entire day for more exploration after the tour.